Delaware College of Art and Design views drawing as both the foundation for all of the art and design disciplines and a key element of the associate of fine arts degree. Similarly, Henry Bermudez views drawing as the technical skill that informs all of his work. The largely monochromatic pieces making up DCAD’s “Henry Bermudez in Black and White” exhibition celebrate the simplicity of drawing while refreshing the definition of the discipline. 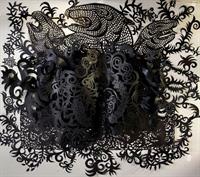 In addition to traditional pieces, the Venezuela-born, Philadelphia-based artist is showing large-scale, three-dimensional installations of “drawings” created in cut paper. Bermudez attended the National Schools of Art in Venezuela and was awarded a scholarship to La Esmeralda National School of Painting, Sculpture and Printmaking in Mexico. He also studied in Rome and at New York City’s Art Students League. In 1986, he represented Venezuela in La Biennale di Venezia – the Venice Biennale. Since coming to the United States, Bermudez has completed several Mural Arts Program of Philadelphia commissions and was chosen to work with the Philagrafika print collaborative. He received a Pollock-Krasner Foundation Grant in 2012, was selected to present a Philadelphia International Airport Art installation in 2014 and is a current recipient of a Peter Benoliel Fellowship from Philadelphia’s Center For Emerging Visual Artists. Bermudez also teaches art at the Career and Academic Development Institute and the Fleisher Art Memorial and is co-director of HouseGallery1816. “Henry Bermudez in Black and White” will open in DCAD’s Toni & Stuart B. Young Gallery with a reception from 5 to 8 p.m. Friday, Oct. 5, in conjunction with Art Loop Wilmington and continue through Oct. 25. Gallery hours from Oct. 6 to 25 will be 10 a.m. to 6 p.m. Mondays, Tuesdays, Thursdays and Fridays; 10 a.m. to 7 p.m. Wednesdays; and 10 a.m. to 4 p.m. Saturdays and Sundays. Also opening with receptions that night will be two exhibitions of work created and curated by DCAD students. One will be in the Tatiana Copeland Student Center Gallery, located on the first floor of DCAD’s Saville Residence Hall at Sixth and Market streets. The other will be at NextFab makerspace, 503 N. Tatnall St., where DCAD students take courses in three-dimensional design. Tatiana Copeland Student Center Gallery hours are by appointment after the opening. NextFab hours are 2 to 10 p.m. Tuesday through Thursday and 10 a.m. to 6 p.m. Friday and Saturday. Admission to all three of DCAD’s October exhibitions is free and open to the public. For further information, contact DCAD communications director Susan Coulby at 302-622-8000 (office), 302-983-5710 (cell) or scoulby@dcad.edu.